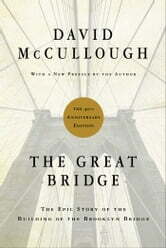 Another epic story from one of my favorite authors, David McCullough. A fabulous history of the building of the Brooklyn Bridge by a dreamer with limitless vision and his unexcelled engineer son who converted detailed dreams into reality at the cost of his health. None of it would have been possible without the outstanding assistance of Emily Robling, wife of the son.